Yes, it exists. Yes, they totally renamed North Tarrytown to Sleepy Hollow, NY, back in '97. They say "in honor of" Washington Irving's Legend of, but really, it was to help add to the commercial viability of the area. Actually, Sleepy Hollow's just one of many locations under the Historic Hudson Valley domain, an organization which has managed to keep me coming back a few times over the last several years. 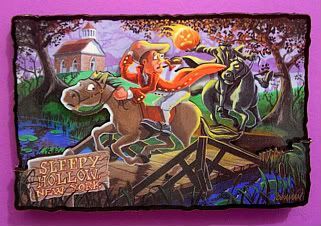 So, that whole Sleepy Hollow renaming thing seems to have worked out well! After all, who doesn't want to visit Sleepy Hollow to check out where the Headless Horseman rode? Or visit Sleepy Hollow Cemetery? According to my friends who went yesterday and bought this magnet for me (yay! ), everyone's interred there! People like Andrew Carnegie to Elizabeth Arden - that place is like the Hollywood Forever cemetery of the east. Creepy! Well, it was probably creepier there than the Legend Nights at Philipsburg Manor, that I mentioned yesterday. Remember? It was the "wander the mysterious grounds and interact with witches, pirates, and spooky apparitions" thing? Ummm, yeah. I hate to say it, because I know all those performers out in the cold, and the organizers, probably worked their hearts out on Legend Nights. I think we just had our expectations a little high. I know I was on maximum scare alert for the hours leading up to it - and not just because a seven-year-old promised me she'd scare me before the night was up. But, we really thought it was going to be superduper scary. Well, I did, anyway. In the end, me, the fraidy cat wasn't scared at all. It probably had more to do with the disenchanted, mocking teenagers behind me mocking the ghosties in the barn, than anything else. Obviously, the nights are definitely a family-friendly, kid-focused night out. I was a little sad not to be able to hear the tale of Ichabod Crane as told by Jonathan Kruk. I think had we been able to start at the beginning, I would have loved to watch and listen. But, he was the first stop, after a hike around the lanterned lake, and the most crowded. So, we pushed forward. But the highlight of the night was the pasture where a penned up Headless Horseman (two, actually) was riding with his jack o'lantern in hand. That was actually kinda cool, especially when he'd appear from the far end of the pasture and come galloping right up to the fence. So, I suppose the evening was a success - after all, we did see the Horseman ride. A few times. Though, I'm still puzzling over how my friend thinks that the Headless Horseman's kinda hot. Although I really do like that movie. Hee. Yep. Sleepy Hollow, the one and same. Kinda freaky, that.